Are bad men born, or are they made? I don't know. Nate Flexer might, though. 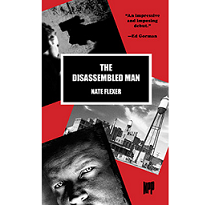 The author of The Disassembled Man is at least certain of one thing: a bad man can make things very, very much worse for himself. And the poor bastards around him. I saw an old woman walking with a cane. Her hair was blue and she was wearing Ray Charles sunglasses. She was holding a flower purse. I asked her for the time, then shoved her to the ground. She fractured her hip. I grabbed her purse. As I fled the scene I rifled through the contents. Drivers license, American Express, dirty handkerchief, photo of her dead husband, photo of her ugly grandchildren, pack of gum. Twelve dollars in cash. I did some quick math. At this pace I'd have to mug more than 300 grandmas. That might take me all night. This ain’t even close to what he’s capable of. Frankie quits his job at an Arizona slaughterhouse by torturing a steer and setting it loose on the killing floor, determined to change his destiny, to climb out of his shithole on a vapor trail of cheap booze. His fat wife, who he hates, has a rich father, see. Oh, and he's in love with a stripper named Scarlett Aces. Who just so happens to be under the protection of a local gangster. Meanwhile a mysteriously omniscient salesman keeps paying him visits, selling nothing but smug advice. Oh, and did I mention Frankie's past is littered with bodies and blood? You might guess that this won't end well. I'm here to tell you: it's worse than you think. Frankie Avicious relentlessly kicks against the pricks, but there's always more, and they're always coming for him. Flexer is unflinching, man; nothing is too low for Avicious to stoop to, or Flexer to document. A gripe you could level is that no one, anywhere, seems able to grasp even the tiniest shaft of hope. Unremitting darkness runs the risk of collapsing into reverse-image sentimentality. It's a tough line to walk, but Flexer manages it. The ending, true enough, will have you cringing from your Kindle. But it does let a little whiff of justice into the story, which you may or may not find a touch jarring, depending on your theological outlook. The Disassembled Man is chockablock with moments you're not sure you should be laughing at, but you do anyway, even as Frankie Avicious spins deeper and deeper into his own muck. Skeletons dancing on a shallow grave way out in the desert, passing a bottle of mescal around: you're starting to get the idea. Totally contemptible and utterly dispicable, Frankie Avicious will nonetheless insist that you come along for the ride, and Nate Flexer's got the writing chops to make sure you keep your hands and feet inside the car. You'll be glad you weren't made a man like Frankie Avicious. Nor born one, either. *Note: the title of this post is one of my favorite one-liners lifted straight from the book. Court Merrigan runs the Bareknuckles Pulp Department here at Out of the Gutter. His short story collection, MOONDOG OVER THE MEKONG, is out soon from Snubnose Press. He’s a Spinetingler Award nominee with stories forthcoming or appearing at Weird Tales, Needle, Beat to a Pulp, Plots With Guns, Noir Nation, Big Pulp, PANK, and Spinetingler. Links at http://courtmerrigan.wordpress.com. He lives in Wyoming with his family.